Identity Management supports three user account states: stage, active, and preserved. Stage users are not allowed to authenticate. This is an initial state. Some of the user account properties required for active users might not yet be set. Active users are allowed to authenticate. All required user account properties must be set in this state. Preserved users are former active users. They are considered inactive and cannot authenticate to IdM. Preserved users retain most of the account properties they had as active users, but they are not part of any user groups. The list of users in the preserved state can provide a history of past user accounts. User entries can also be permanently deleted from the IdM database. Deleting a user entry permanently removes the entry itself and all its information from IdM, including group memberships and passwords. Any external configuration for the user, such as the system account and home directory, is not deleted, but is no longer accessible through IdM. Deleted user accounts cannot be restored. When you delete a user account, all the information associated with the account is lost permanently. A new administrator user can only be created by another administrator, such as the default admin user. If you accidentally delete all administrator accounts, the Directory Manager must create a new administrator manually in the Directory Server. To manage user provisioning, the administrator can move user accounts from one state to another. New user accounts can be added as either active or stage, but not as preserved. When an account in the stage state is ready to be properly activated, the administrator moves it to the active state. After the user leaves the company, the administrator moves the account to the preserved state. A former user joins the company again. The administrator restores the user account by moving it from the preserved state back to the active state. A former user is planning to join the company again. The administrator moves the account from the preserved state to the stage state to prepare the account for later reactivation. You can also permanently delete active, stage, and preserved users from IdM. Note that you cannot move stage users to the preserved state, you can only delete them permanently. Select the Identity → Users tab. 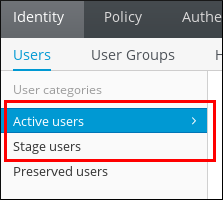 Select the Active users or Stage users category, depending on whether you want to add a user in the active or stage state. For more information about the active or stage user life cycle states, see Section 11.2, “User Life Cycle”. Click Add at the top of the users list. Fill in the Add User form. Note that if you do not set a user login manually, IdM generates the login automatically based on the specified first name and last name. Alternatively, click Add and Add Another to start adding another user or Add and Edit to start editing the new user entry. For information on editing user entries, see Section 11.3, “Editing Users”. To add a new user in the active state, use the ipa user-add command. To add a new user in the stage state, use the ipa stageuser-add command. When run without any options, ipa user-add and ipa stageuser-add prompt you for the minimum required user attributes and use default values for the other attributes. Alternatively, you can add options specifying various attributes directly to the commands. In the interactive session, after you run the command without any options, IdM proposes an automatically generated user login based on the provided first name and last name and displays it in brackets ([ ]). To accept the default login, confirm by pressing Enter. To specify a custom login, do not confirm the default and specify the custom login instead. For a complete list of options accepted by ipa user-add and ipa stageuser-add, run the commands with the --help option added. User names ending with the trailing dollar sign ($) are supported to enable Samba 3.x machine support. If you add a user whose user name contains uppercase characters, IdM automatically converts the name to lowercase when saving it. Therefore, IdM always requires users to enter their user names all lowercase when logging in. Additionally, it is not possible to add users whose user names only differ in letter casing, such as user and User. If you add a new user entry without specifying a custom UID or GID number, IdM automatically assigns an ID number that is next available in the ID range. This means that users' ID numbers are always unique. For more information about ID ranges, see Chapter 14, Unique UID and GID Number Assignments. When you specify a custom ID number, the server does not validate whether the custom ID number is unique. Due to this, multiple user entries might have the same ID number assigned. Red Hat recommends to prevent having multiple entries with the same ID number. Select the Active users, Stage users, or Preserved users category. To list all active users run the ipa user-find command. To list all stage users, use the ipa stageuser-find command. To list preserved users, run the ipa user-find --preserved=true command. For a complete list of options accepted by ipa user-find and ipa stageuser-find, run the commands with the --help option added. This section describes moving user accounts between different user life cycle states. For details on the life cycle states in IdM, see Section 11.2, “User Life Cycle”. In the Stage users list, select the user to activate, and click Activate. 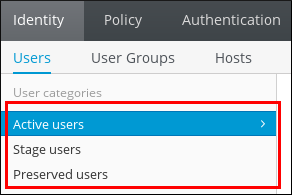 In the Active users or Stage users lists, select the user. Click Delete. If you selected an active user, select delete or preserve. If you selected a stage user, you can only delete the user. The default UI option is delete. To confirm, click the Delete button. In the Preserved users list, select the user to restore, and click Restore. Restoring a user does not restore all of the account's previous attributes. For example, the user's password is not restored and must be defined again. Note that in the web UI, it is not possible to move a user from the preserved state to the stage state. To activate a user account by moving it from stage to active, use the ipa stageuser-activate command. To preserve or delete a user account, use the ipa user-del or ipa stageuser-del commands. To remove an active user permanently from the IdM database, run ipa user-del without any options. To preserve an active user account, run ipa user-del with the --preserve option. To remove a stage user permanently from the IdM database, run ipa stageuser-del. When deleting multiple users, use the --continue option to force the command to continue regardless of errors. A summary of the successful and failed operations is printed to the stdout standard output stream when the command completes. If --continue is not used, the command proceeds with deleting users until it encounters an error, after which it stops and exits. To restore a preserved user account by moving it from preserved to active, use the ipa user-undel command. To restore a preserved user account by moving it from preserved to stage, use the ipa user-stage command. Restoring a user account does not restore all of the account's previous attributes. For example, the user's password is not restored and must be defined again. For more information about these commands and the options they accept, run them with the --help option added.